Yesterday NASA said during a press conference that there is a chance life may still exist on Mars. Back in 2003 and 2006 the Earth based Keck Telescope in Hawaii detected huge bursts of methane gas on the surface of the Red Planet. After pouring over the data for years, the team of scientists analyzing these inexplicable events released their preliminary conclusions yesterday. NASA says these gaseous emissions are from either microscopic life forms or some unusual geologic phenomenon. They're hedging their bets a little becasue the agency jumped the gun once before, when in 1996 they announced that tiny structures on a Martian meteorite could be fossils of extraterrestrial bacteria. The announcement caused a great sensation at the time, but over the years alternate explanations have shown to be equally plausible. This time they're being much more cautious. In the words of team leader Michael Mumma, "Right now, we do not have enough information to tell whether biology or geology -- or both -- is producing the methane on Mars…But it does tell us the planet is still alive, at least in a geologic sense." That's really saying a lot. Mars has been thought of as a dead planet for years, but the team simply hasn't been able to defiantly rule out life as the source of these methane emissions. Today the surface of Mars is a cold and barren place, but it wasn’t always like that. Far back, in its much warmer past the Red Planet once had its own blue oceans and rivers. It's theoretically possible that life was able to gain a foothold under these milder conditions. Mars's climate cooled dramatically over the millennia. Most of its liquid water evaporated away or froze underground into the nearly inhospitable place it is today. If there are microbes belching methane, it's likely they live far underground, where Mars's warm core keeps the normally frozen water liquid. What makes these methane emissions so exciting is that Mars has been long thought to be geologically inactive. 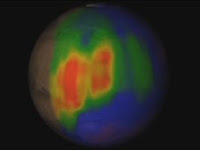 There are no known active volcanoes on Mars that would produce this gas. In addition, other elements usually associated with volcanic eruptions, such as sulfur, don't seem to be present. It is possible that the gas has been stored as solid deposits below the planet's surface for millennia, which is why more study is needed before anyone can say anything definitively. Even if it does turn out that its geology not biology behind these methane emissions, that alone would be Earthshaking (Marshaking?) because it shows the Red Planet isn't as geologically dead as we previously thought. It will likely be many years before we are able to land a rig on Mars to drill down to investigate first hand what's emitting this gas, but it gives us a tremendous impetus to keep searching for answers. It's way too early to jump the gun and declare Mars a wildlife reserve, but it's a promising piece of evidence. Personally I really hope down the line it turns out to be microorganisms. If two planets in the same solar system are capable of sustaining life, than odds are we aren't nearly so alone in the universe as it seems.